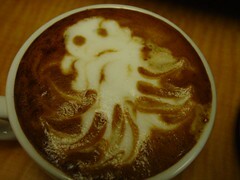 That is one scary Latte! It was yummy too! Halloween was fun and busy at Bjava Coffee. We were featuring our "Scary Berry" Smoothie, and Pumpkin Lattes.